— A iTi.ncUtJ ^i:r;iiiLri:y ill thii It. T^al i.i I Li ;/:h Ceiiturj- cabinet, illns! riitec! iu the fbyaA afltliijn flf Chapter iu., -will be observed. One noticeable feature of modern design in furniture is the revival of marquetry. Like all mosaic work, to which branch of Industrial Art it properly belongs, this kind of decoration should be quite subordinate to the general design; but with the rage for novelty which seized public attention some forty years ago, it developed into the production of all kinds of fantastic patterns in different veneers. A kind of minute mosaic work in wood, which was called "Tunbridge Wells work," became fashionable for small articles. Within the last ten or fifteen years the reproductions of what is termed "Chippendale," and also Adam and Sheraton designs in marqueterie furniture, have been manufactured to an enormous extent. Partly on account of the difficulty in obtaining the richly-marked and figured old mahogany and satin-wood of a hundred years ago, which needed little or no inlay as ornament, and partly to meet the public fancy by covering up bad construction with veneers of marquetry decoration, a great deal more inlay has been given to these reproductions than ever appeared in the original work of the eighteenth century cabinet makers. Simplicity was sacrificed, and veneers, thus used and abused, came to be a term of contempt, implying sham or superficial ornament. Dickens, in one of his novels, has introduced the "Veneer" family, thus stamping the term more strongly on the popular imagination. The method now practised in using marquetry to decorate furniture is very similar to the one explained in the description of "Boule" furniture given in Chapter VI., except that, instead of shell, the marquetry cutter uses the veneer, which he intends to be the groundwork of his design, and as in some cases these veneers are cut to the thickness of 1/16 of an inch, several layers can be sawn through at once. Sometimes, instead of using so many different kinds of wood, when a very polychromatic effect is required, holly wood and sycamore are stained different colours, and the marquetry thus prepared, is glued on to the body of the furniture, and subsequently prepared, engraved, and polished. This kind of work is done to a great extent in England, but still more extensively and elaborately in France and Italy, where ivory and brass, marble, and other materials are also used to enrich the effect. This effect is either satisfactory or the reverse according as the work is well or ill-considered and executed. It must be obvious, too, that in the production of marquetry the processes are attainable by machinery, which saves labour and cheapens productions of the commoner kinds; this tends to produce a decorative effect which is often inappropriate and superabundant. Perhaps it is allowable to add here that marquetry, or marqueterie, its French equivalent, is the more modern survival of "Tarsia" work to which allusion has been made in previous chapters. Webster defines the word as "Work inlaid with pieces of wood, shells, ivory, and the like," derived from the French word marqueter to checker and marque (a sign), of German origin. It is distinguished from parquetry (which is derived from "pare," an enclosure, of which it is a diminutive), and signifies a kind of joinery in geometrical patterns, generally used for flooring. When, however, the marquetry assumes geometrical patterns (frequently a number of cubes shaded in perspective) the design is often termed in Art catalogues a "parquetry" design. In considering the design and manufacture of furniture of the present day, as compared with that of, say, a hundred years ago, there are two or three main factors to be taken into account. Of these the most important is the enormously increased demand, by the multiplication of purchasers, for some classes of furniture, which formerly had but a limited sale. This enables machinery to be used to advantage in economising labour, and therefore one finds in the so-called "Queen Anne" and "Jacobean" cabinet work of the well furnished house of the present time, rather too prominent evidence of the lathe and the steam plane. Mouldings are machined by the length, then cut into cornices, mitred round panels, or affixed to the edge of a plain slab of wood, giving it the effect of carving. 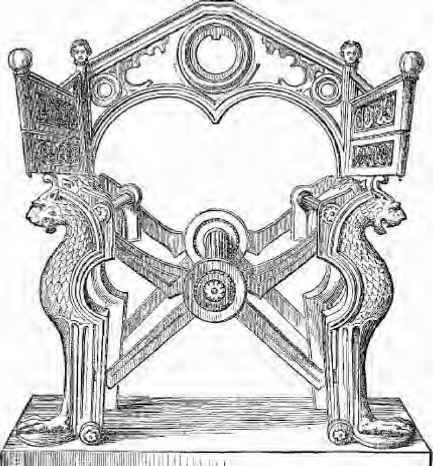 The everlasting spindle, turned rapidly by the lathe, is introduced with wearisome redundance, to ornament the stretcher and the edge of a shelf; the busy fret or band-saw produces fanciful patterns which form a cheap enrichment when applied to a drawer-front, a panel, or a frieze, and carving machines can copy any design which a century ago were the careful and painstaking result of a practised craftsman's skill. Again, as the manufacture of furniture is now chiefly carried on in large factories, both in England and on the Continent, the sub-division of labour causes the article to pass through different hands in successive stages, and the wholesale manufacture of furniture by steam has taken the place of the personal supervision by the master's eye of the task of a few men who were in the old days the occupants of his workshop. As a writer on the subject has well said, "the chisel and the knife are no longer in such cases controlled by the sensitive touch of the human hand." In connection with this we are reminded of Ruskin's precept that "the first condition of a work of Art is that it should be conceived and carried out by one person." Instead of the carved ornament being the outcome of the artist's educated taste, which places on the article a stamp of individuality—instead of the furniture being, as it was in the seventeenth century in England, and some hundred years earlier in Italy and in France, the craftsman's pride—it is now the result of the rapid multiplication of some pattern which has caught the popular fancy, generally a design in which there is a good deal of decorative effect for a comparatively small price. The difficulty of altering this unsatisfactory state of things is evident. On the one side, the manufacturers or the large furnishing firms have a strong case in their contention that the public will go to the market it considers the best: and when decoration is pitted against simplicity, though the construction which accompanies the former be ever so faulty, the more pretentious article will be selected. When a successful pattern has been produced, and arrangements and sub-contracts have been made for its repetition in large quantities, any considerable variation made in the details (even if it be the suppression of ornament) will cause an addition to the cost which those only who understand something of a manufacturer's business can appreciate. During the present generation an Art movement has sprung up called ^stheticism, which has been defined as the "Science of the Beautiful and the Philosophy of the Fine Arts," and aims at carrying a love of the beautiful into all the relations of life. The fantastical developments which accompanied the movement brought its devotees into much ridicule about ten years ago, and the pages of Punch of that time will be found to happily travesty its more amusing and extravagant aspects. The great success of Gilbert and Sullivan's operetta, "Patience," produced in 1881, was also to some extent due to the humorous allusions to the extravagances of the "Aesthetetes." In support of what may be termed a higher ^stheticism, Mr. Ruskin has written much to give expression to his ideas and principles for rendering our surroundings more beautiful. Sir Frederic Leighton and Mr. Alma Tadema are conspicuous amongst those who have in their houses carried such principles into effect, and amongst other artists who have been and are, more or less, associated with this movement, may be named Rossetti, Burne Jones, and Holman Hunt. As a writer on ^stheticism has observed:—"When the extravagances attending the movement have been purged away, there may be still left an educating influence, which will impress the lofty and undying principles of Art upon the minds of the people." For a time, in-spite of ridicule, this so-called ^stheticism was the vogue, and considerably affected the design and decoration of furniture of the time. Woodwork was painted olive green; the panels of cabinets, painted in sombre colors, had pictures of sad-looking maidens, and there was an attempt at a "dim religious" effect in our rooms quite inappropriate to such a climate as that of England. The reaction, however, from the garish and ill-considered colourings of a previous decade or two has left behind it much good, and with the catholicity of taste which marks the furnishing of the present day, people see some merit in every style, and are endeavouring to select that which is desirable without running to the extreme of eccentricity. Perhaps the advantage thus gained is counterbalanced by the loss of our old "traditions," for amongst the wilderness of reproductions of French furniture, more or less frivolous—of Chippendale, as that master is generally understood—of what is termed "Jacobean" and "Queen Anne"—to say nothing of a quantity of so-called "antique furniture," we are bewildered in attempting to identify this latter end of the nineteenth century with any particular style of furniture. By "tradition" it is intended to allude to the old-fashioned manner of handing down from father to son, or master to apprentice, for successive generations, the skill to produce any particular class of object of Art or manufacture. Surely Ruskin had something of this in his mind when he said, "Now, when the powers of fancy, stimulated by this triumphant precision of manual dexterity, descend from generation to generation, you have at last what is not so much a trained artist, as a new species of animal, with whose instinctive gifts you have no chance of contending." Tradition may be said to still survive in the country cartwright, who produces the farmer's wagon in accordance with custom and tradition, modifying the method of construction somewhat perhaps to meet altered conditions of circumstances, and then ornamenting his work by no particular set design or rule, but partly from inherited aptitude and partly from playfulness or fancy. In the house-carpenter attached to some of our old English family estates, there will also be found, here and there, surviving representatives of the traditional "joyner" of the seventeenth century, and in Eastern countries, particularly in Japan, we find the dexterous joiner or carver of to-day is the descendant of a long line of more or less excellent mechanics. It must be obvious, too, that "Trades Unionism" of the present day cannot but be, in many of its effects, prejudicial to the Industrial Arts. A movement which aims at reducing men of different intelligence and ability, to a common standard, and which controls the amount of work done, and the price paid for it, whatever are its social or economical advantages, must have a deleterious influence upon the Art products of our time. Writers on Art and manufactures, of varying eminence and opinion, are unanimous in pointing out the serious drawbacks to progress which will exist, so long as there is a demand for cheap and meretricious imitations of old furniture, as opposed to more simply made articles, designed in accordance with the purposes for which they are intended. Within the past few years a great many well directed endeavours have been made in England to improve design in furniture, and to revive something of the feeling of pride and ambition in his craft, which, in the old days of the Trade Guilds, animated our Jacobean joiner. One of the best directed of these enterprises is that of the "Arts and Crafts Exhibition Society," of which Mr. Walter Crane, A.R.W.S., is president, and which numbers, amongst its committee and supporters, a great many influential names. As suggested in the design of the cover of their Exhibition Catalogue, drawn by the President, one chief aim of the society is to link arm in arm "Design and Handicraft," by exhibiting only such articles as bear the names of individuals who (1) drew the design and (2) carried it out: each craftsman thus has the credit and responsibility of his own part of the work, instead of the whole appearing as the production of Messrs. A.B. or C.D., who may have known nothing personally of the matter, beyond generally directing the affairs of a large manufacturing or furnishing business. In the catalogue published by this Society there are several short and useful essays in which furniture is treated, generally and specifically, by capable writers, amongst whom are Mr. Walter Crane, Mr. Edward Prior, Mr. Halsey Ricardo, Mr. Reginald T. Blomfield, Mr. W.R. Letharby, Mr. J.H. Pollen, Mr. Stephen Webb, and Mr. T.G. Jackson, A.R.A., the order of names being that in which the several essays are arranged. This small but valuable contribution to the subject of design and manufacture of furniture is full of interest, and points out the defects of our present system. Amongst other regrets, one of the writers (Mr. Halsey Ricardo) complains, that the "transient tenure that most of us have in our dwellings, and the absorbing nature of the struggle that most of us have to make to win the necessary provisions of life, prevent our encouraging the manufacture of well wrought furniture. We mean to outgrow our houses—our lease expires after so many years, and then we shall want an entirely different class of furniture—consequently we purchase articles that have only sufficient life in them to last the brief period of our occupation, and are content to abide by the want of appropriateness or beauty, in the clear intention of some day surrounding ourselves with objects that shall be joys to us for the remainder of our life." Many other societies, guilds, and art schools have been established with more or less success, with the view of improving the design and manufacture of furniture, and providing suitable models for our young wood carvers to copy. The Ellesmere Cabinet (illustrated) was one of the productions of the "Home Arts and Industries Association," founded by the late Lady Marian Alford in 1883, a well known connoisseur and Art patron. It will be seen that this is virtually a Jacobean design. In the earlier chapters of this book, it has been observed that as Architecture became a settled Art or Science, it was accompanied by a corresponding development in the design of the room and its furniture, under, as it were, one impulse of design, and this appropriate concord may be said to have obtained in England until nearly the middle of the present century, when, after the artificial Greek style in furniture and woodwork which had been attempted by Wilkins, Soane, and other contemporary architects, had fallen into disfavour, there was first a reaction, and then an interregnum, as has been noticed in the previous chapter. The Great Exhibition marked a fresh departure, and quickened, as we have seen, industrial enterprise in this country; and though, upon the whole, good results have been produced by the impetus given by these international competitions, they have not been exempt from unfavorable accompaniments. One of these was the eager desire for novelty, without the necessary judgment to discriminate between good and bad. For a time, nothing satisfied the purchaser of so-called "artistic" products, whether of decorative furniture, carpets, curtains or merely ornamental articles, unless the design was "new." The natural result was the production either of heavy and ugly, or flimsy and inappropriate furniture, which has been condemned by every writer on the subject. In some of the designs selected from the exhibits of '51 this desire to leave the beaten track of conventionality will be evident: and for a considerable time after the exhibition there is to be seen in our designs, the result of too many opportunities for imitation, acting upon minds insufficiently trained to exercise careful judgment and selection. 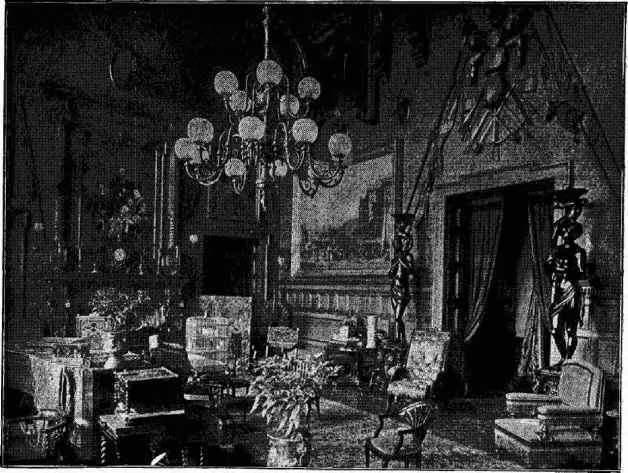 The custom of appropriate and harmonious treatment of interior decorations and suitable furniture, seems to have been in a great measure abandoned during the present century, owing perhaps to the indifference of architects of the time to this subsidiary but necessary portion of their work, or perhaps to a desire for economy, which preferred the cheapness of painted and artificially grained pine-wood, with decorative effects produced by wall papers, to the more solid but expensive though less showy wood-panelling, architectural mouldings, well-made panelled doors and chimney pieces, which one finds, down to quite the end of the last century, even in houses of moderate rentals. Furniture therefore became independent and "beginning to account herself an Art, transgressed her limits" ... and "grew to the conceit that it could stand by itself, and, as well as its betters, went a way of its own." 22 The interiors, handed over from the builder, as it were, in blank, are filled up from the upholsterer's store, the curiosity shop, and the auction room, while a large contribution from the conservatory or the nearest florist gives the finishing touch to a mixture, which characterizes the present taste for furnishing a boudoir or a drawing room. 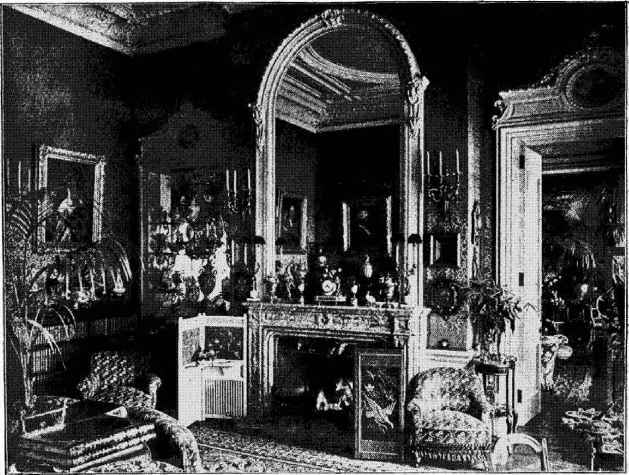 THE SALOON AT SANDR1NÜHAM HOUSE. There is at the present time an ambition on the part of many well-to-do persons to imitate the effect produced in houses of old families where, for generations, valuable and memorable articles of decorative furniture have been accumulated, just as pictures, plate and china have been preserved; and failing the inheritance of such household gods, it is the practice to acquire, or as the modern term goes, "to collect," old furniture of different styles and periods, until the room becomes incongruous and overcrowded, an evidence of the wealth, rather than of the taste, of the owner. As it frequently happens that such collections are made very hastily, and in the brief intervals of a busy commercial or political life, the selections are not the best or most suitable; and where so much is required in a short space of time, it becomes impossible to devote a sufficient sum of money to procure a really valuable specimen of the kind desired; in its place an effective and low priced reproduction of an old pattern (with all the faults inseparable from such conditions) is added to the conglomeration of articles requiring attention, and taking up space. The limited accommodation of houses built on ground which is too valuable to allow spacious halls and large apartments, makes this want of discretion and judgment the more objectionable. There can be no doubt that want of care and restraint in the selection of furniture, by the purchasing public, affects its character, both as to design and workmanship. THE DRAWING ROOM AT SAM DfilNGHAM HOUSE. These are some of the faults in the modern style of furnishing, which have been pointed out by recent writers and lecturers on the subject. In "Hints on Household Taste," 23 Mr. Eastlake has scolded us severely for running after novelties and fashions, instead of cultivating suitability and simplicity, in the selection and ordering of our furniture; and he has contrasted descriptions and drawings of well designed and constructed pieces of furniture of the Jacobean period with those of this century's productions. Col. Robert Edis, in "Decoration and Furniture of Town Houses," has published designs which are both simple and economical, with regard to space and money, while suitable to the specified purpose of the furniture or "fitment." This revival in taste, which has been not inappropriately termed "The New Renaissance," has produced many excellent results, and several well-known architects and designers in the foremost rank of art, amongst whom the late Mr.
Street, R.A.; Messrs. Norman Shaw, R.A.; Waterhouse, R.A.; Alma Tadema, R.A.; T. G. Jackson, A.R.A. ; W. Burgess, Thomas Cutler, E. W. Godwin, S. Webb, and many others, have devoted a considerable amount of attention to the design of furniture. The ruling principle in the majority of these designs has been to avoid over ornamentation, and pretension to display, and to produce good solid work, in hard, durable, and (on account of the increased labour) expensive woods, or, when economy is required, in light soft woods, painted or enamelled. Some manufacturing firms, whom it would be invidious to name, and whose high reputation renders them independent of any recommendation, have adopted this principle, and, as a result, there is now no difficulty in obtaining well designed and soundly constructed furniture, which is simple, unpretentious, and worth the price charged for it. Unfortunately for the complete success of the new teaching, useful and appropriate furniture meets with a fierce competition from more showy and ornate productions, made to sell rather than to last: furniture which seems to have upon it the stamp of our "three years' agreement," or "seven years' lease." Of this it may be said, speaking not only from an artistic, but from a moral and humane standpoint, it is made so cheaply, that it seems a pity it is made at all. The disadvantages, inseparable from our present state of society, which we have noticed as prejudicial to English design and workmanship, and which check the production of really satisfactory furniture, are also to be observed in other countries; and as the English, and English-speaking people, are probably the largest purchasers of foreign manufacturers, these disadvantages act and re-act on the furniture of different nations. In France, the cabinet maker has ever excelled in the production of ornamental furniture; and by constant reference to older specimens in the Museums and Palaces of his country, he is far better acquainted with what may be called the traditions of his craft than his English brother. With him the styles of Francois Premier, of Henri Deux, and the "three Louis" are classic, and in the beautiful chasing and finishing of the mounts which ornament the best meubles de luxe, it is almost impossible to surpass his best efforts, provided the requisite price be paid; but this amounts in many cases to such considerable sums of money as would seem incredible to those who have but little knowledge of the subject. As a simple instance, the "copy" of the "Bureau du Louvre" (described in Chapter vi.) in the Hertford House collection, cost the late Sir Richard Wallace a sum of £4,000. As, however, in France, and in countries which import French furniture, there are many who desire to have the effect of this beautiful but expensive furniture, but cannot afford to spend several thousand pounds in the decoration of a single room, the industrious and ingenious Frenchman manufactures, to meet this demand, vast quantities of furniture which affects, without attaining, the merits of the better made and more highly finished articles. In Holland, Belgium, and in Germany, as has already been pointed out, the manufacture of ornamental oak furniture, on the lines of the Renaissance models, still prevails, and such furniture is largely imported into this country. 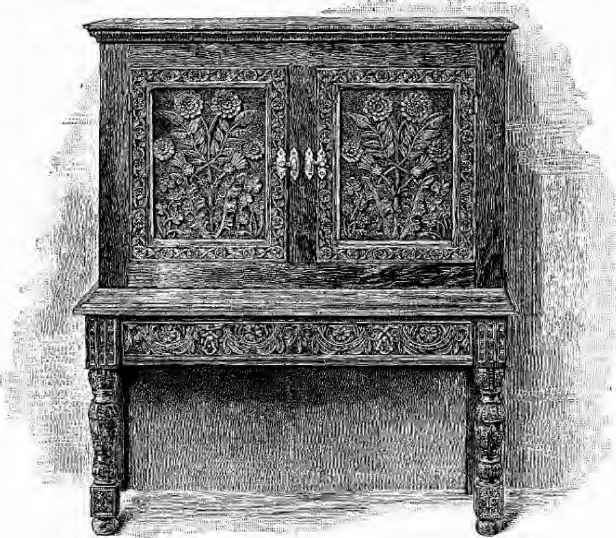 Italian carved furniture of modern times has been already noticed; and in the selections made from the 1851 Exhibition, some productions of different countries have been illustrated, which tend to shew that, speaking generally, the furniture most suitable for display is produced abroad, while none can excel English cabinet makers in the production of useful furniture and woodwork, when it is the result of design and handicraft, unfettered by the detrimental, but too popular, condition that the article when finished shall appear to be more costly really than it is. 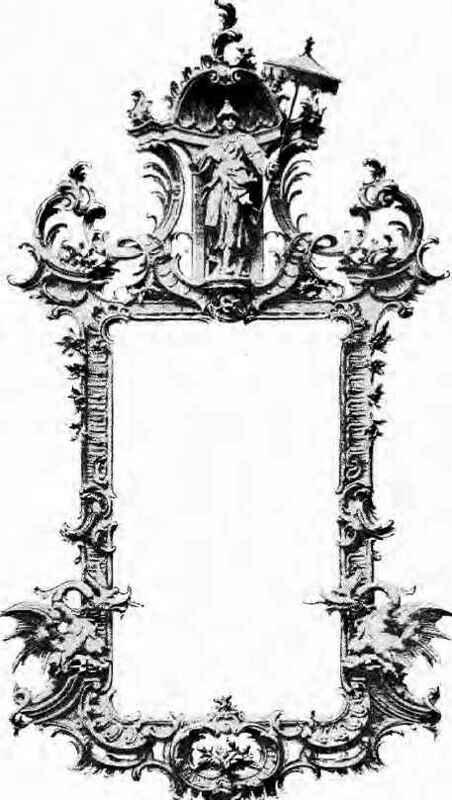 The illustration of a carved frame in the rococo style of Chippendale, with a Chinaman in a canopy, represents an important school of wood carving which has been developed in Munich; and in the "Kunst Gewerberein," or "Workman's Exhibition," in that city, the Bavarians have a very similar arrangement to that of the Arts and Crafts Exhibition Society of this country, of which mention has already been made. Each article is labelled with the name of the designer and maker. In conclusion, it seems evident that, with all the faults and shortcomings of this latter part of the nineteenth century—and no doubt they are many, both of commission and omission—still, speaking generally, there is no lack of men with ability to design, and no want of well trained patient craftsmen to produce, furniture which shall equal the finest examples of the Renaissance and Jacobean periods. With the improved means of inter-communication between England and her Colonies, and with the chief industrial centres of Europe united for the purposes of commerce, the whole civilized world is, as it were, one kingdom: merchants and manufacturers can select the best and most suitable materials, can obtain photographs or drawings of the most distant examples, or copies of the most expensive designs, while the public Art Libraries of London, and Paris, contain valuable works of reference, which are easily accessible to the student or to the workman. It is very pleasant to bear testimony to the courtesy and assistance which the student or workman invariably receives from those who are in charge of our public reference libraries. cah_ví:p 1-~k.mil:., ñv rat^fieler, Munich. There needs, however, an important condition to be taken into account. Good work, requiring educated thought to design, and skilled labour to produce, must be paid for at a very different rate to the furniture of machined mouldings, stamped ornament, and other numerous and inexpensive substitutes for handwork, which our present civilization has enabled our manufacturers to produce, and which, for the present, seems to find favour with the multitude. It has been well said that, "Decorated or sumptuous furniture is not merely furniture that is expensive to buy, but that which has been elaborated with much thought, knowledge, and skill. Such furniture cannot be cheap certainly, but the real cost is sometimes borne by the artist who produces, rather than by the man who may happen to buy it." 24 It is often forgotten that the price paid is that of the lives and sustenance of the workers and their families.